Did you know that September is Chicken Month??? According to to Holiday Insights it is!!! In honour of chicken month, this week the crew at SHOPPING OUR STASH would like you to use a chicken OR any bird on your project. I got a really cool card in the mail from my crafty friend Jenn Tinline that just also happened to feature a bird...I loved the layout of the card, the card base is a 5 1/2 x 4 1/4" piece of cardstock (the pink on Jenn's card) then there is a smaller 10 1/4 x 4" piece that folds in half on top of the base...what a cute and frugal way to use coloured cardstock!! And here's the inside of my card (ya I did something on the inside since that's where the chicken is), so there you can see the white part open on the yellow base...cool huh?? Want to join the fun?? 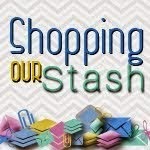 Link up your project on the SHOPPING OUR STASH BLOG and while you are there show my SOS Crew some crafty love!! OH EM GEE I love this layout! And the Sup? sentiment? I think it's my most used out of that set :) LOVE. too cute! I love the fun design/layout also. My sister and father are anti-bird too! Definitely copying that card design... and your card is all kinds of cute! What a flippin' fun card! I love your chickie, especially the sentiment fonts and inside sentiment too! Cute as shite! Beautifully done! I like the spotlight CAS look! The image is adorable. I think the Chicken would be proud of how we have honored him! Just stopped back to let you know that you have been named our CAS "Queen of Clean" Designer Of The Day for Sunday, September 14, 2014. Your project will be featured on our FB page on that day. www.facebook.com/avenue613 . Please stop by, say hello and grab your badge. I can't love this card enough! I'm so trying out that peek-a-boo card cutting technique! Love it, I tell ya!